Yesterday I went for a swim in our condo pool and noticed an older gentleman wearing a Vuarnet France hat. I haven't seen that logo or brand since high school. 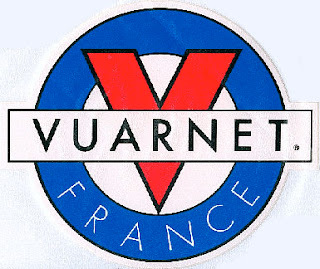 I'm quite sure I have never owned anything Vuarnet, the boys in school wore Vuarnet hats, sunglasses and Vuarnet shirts. I didn't ski and I wasn't into French shiz, so the allure was never there for me. Cool kids had the sunglasses. I was not a cool kid. My ex-boyfriend had the sunglasses. Do they even sell them anymore? Vaguely familiar. Do you remember Z. Cavariccis? Know what was cooler then Vuarnet? haha! i was just going to say that i specifically wanted hypercolour varnet! god, what a magical time. Boyfriend and his friends were just talking about vuarnet a few months back. they were on a mission to bring it back. it was a short lived mission. As best worn with Z. Cavaricci pleated acid-wash jeans, tight-rolled/pegged/whatevs at the ankle. With two pairs of slouch socks of contrasting but totally matching-the-shirt colors. ....and why did it post that twice? Oh, man my brother always bragged about his Vuarnet sunglasses. Every so often he'll stumble across them (he never got rid of them) and ask if he'd look stupid wearing them today. Our mom had a pair too. Hmm. Looks like I was the only one that missed that trend in our family lol! I haven't ever heard of this brand! But, hey, I liked in the rurals of Ohio back then! I don't think that made too much of a splash in CA. But I'm a walking fashion faux pas, so I could be wrong. I had a pair of these, and was so sad when I lost them. I agree with Robyn, maybe I just missed it, but I don't think it was very big out here. Holy crap! I totally remember those. I wanted one so badly, but they were like $40. Much more than my parents were willing to spend. I just stumbled across your blog and Oh. My. GOSH! Vuarnets!!! I've cruised eBay for vintage ones with little success. I was Class of 86 (reunion coming up; shall I dig out my Wayfarers? They hurt my ears). I wanted Vuarnets in the worst way in 1985 but on my $3.35 per hour Burger King salary I couldn't afford them. Darn it! 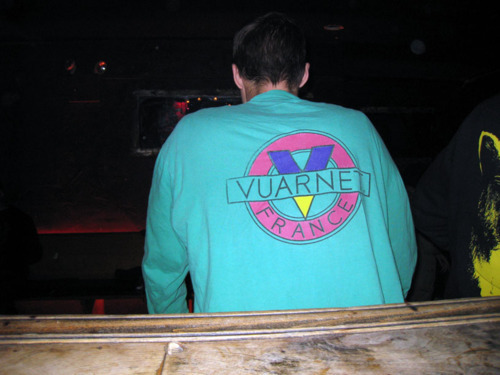 The only people I remember wearing stuff with the Vuarnet logo on it were total snobs; the boys who wore it also wore Polo cologne; barf. My small company imports Vuarnet sunglasses into the U.S. market from France. We sell them online via our www.shadesaver.com and www.vuarnetstore.com websites. We invite you to visit our websites and check out the sunglasses.